My wife and I were out camping — our last big trip in Washington state!! — with some friends this weekend, and things ran late, so here I am on Wednesday with an update. This zombie portrait is one of a set drawn for a “Map of Zombies” supporter’s four nephews and nieces, with each one depicting a different niephew in a different zombie scenario. 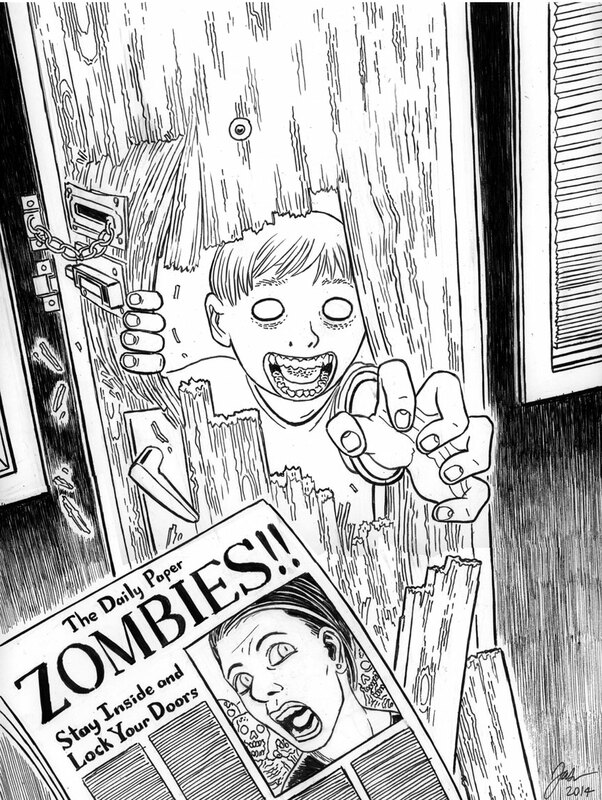 Since the intended recipients are mostly 10 and under, I’ve kept the gore level down, but it was fun drawing this PG-rated zombie-home-invasion scenario. And now for a final break for shameless self-promotion: the moving sale on posters and D&D walkthrough map prints is still going ’till August 18! Get your artwork so I don’t have to move as much of it! The D&D prints should be printed in just a day or two, and I’m looking forward to testing out my new extra-strong tubes that I got, which hopefully will withstand the rigors of the post office better than other tubes that were damaged and bent in the past. I just wonder how the reanimated dead are so strong? Usually it is simply numbers that force the issue. Still nicely drawn.